Discussion in 'Canon InkJet Printers' started by Nifty, Nov 11, 2004. For the record, these are the easiest cartridges to refill! The only "problem" I've had refilling them is trying to seal up the hole I made to inject the ink. I've tried electrical tape, plugs, screws, hot glue, but they all seem to not seal all the way 100% of the time, or leave a residue (elec. tape). I've had the "best" success with the plasti-tac stuff, but sometimes it pushes / falls into the ink tank, or wicks ink out and makes a mess. 3) Electrical tape: sticky residue, doesn't always seal, especially if there is any moisture / ink present. 4) Screws: Sealed great at first, but subsequent times had progressively worse sealing power. 5) Plugs: Didn't get a very good seal most of the time. I've settled on using the cartridges from www.alotofthings.com which have a hole / plug combination that actually works pretty well. Tape is needed on top of the plug to ensure a air tight seal. UPDATE: I've been experimenting with the cloth duct tape and am so far VERY impressed with the results. I've got some on a few different cartridges to test the seal and to see if any residue is left after a while. I'll keep you posted. Silicone seal works great, the tubes are huge, I sucked enough out of a tube into a 3cc syringe, cap the syringe. The sealant peirces easy for future refils, the just use the prefiled 3cc syringe to smear a tad over the peirce. Works easier then plugs for me, I used to lose them at the worst times, which is how I discovered silicone calking, which my husband had to seal a leak in our tub. Nice tip, the caulk even comes in clear. I'll have to remember this if I go the syringe route, thanks! PUCKSMA - Very interesting idea. I know I've got some silicone sealant around here somewhere to try out. So, the stuff your husband used, was it the kitchen bathroom silicone caulking? As I recall it was "silicaone nail" it is clear, we tossed the tube after i a saved what i needed in the 3cc syringe, I'm a nurse so they are available to me easy. & yes for the bathroom & kitchen, we had some leaky spots around our glass where calk had worn. If you use too much, it fails to peirce easy but the plug will pull out when you pull the needle out, then I just scoot another bead of seal back in the hole, it's too thick too drip. Hmm... that sounds like it works pretty well. If my duct tape experiments don't work out I may give the silicone a try. So far I'm pretty impressed with how well the duct tape is plugging the holes without leaving any residue. If it keeps working as well as it has been then I'll be a happy camper. If not, then I'll have to try out the silicone. Note: Do not overfill these cartridges! I refill my cartridges when the ink in the reservoir is at about 1/8 of an inch from the bottom of the tank. I've noticed that when I remove the plug to refill that the last bit of ink is sucked into the sponge. I usually end up injecting about 7 - 8 ml of ink into the cart to bring it just below the level of the sponge on the other side. 1) Ink drips from the outlet hole and I have to wait forever for it to stop. 2) Even after ink has stopped dripping I've found that there may still be too much ink in the cartridge. Contrary to what one would think (expecting that too much ink would cause a big blob mess all over the paper) this actually causes no ink to be printed. From what I understand, this is because there is too much ink on the nozzles stopping them from firing onto the paper. 3) Cross Contamination - (am I the only one scared to death by that phrase?). This was a much worse problem with the old single color carts where once color wicks its way into the other side you're dead. 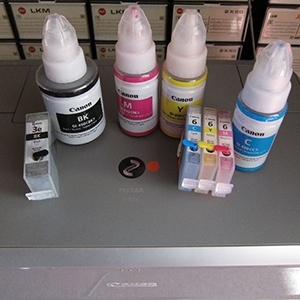 Well, this cross contamination can happen with the BCI-6 carts too if you've got too much ink in the cartridge. Well, if you find yourself in this predicament, as I just did with my magenta cartridge, I've found that by removing the cart, holding it over the sink or garbage can and gently blowing into the air hole / air intake maze above the sponge will force drops of ink out. You'll need to guess how much ink needs to come out, but this has worked for me when I've filled up too much. Interesting thread contrasting with my experience. Have been refilling BCI-6 and BCI-3 cartridges on an i950 and i860 through about 1/2 pint of each color. To restrain ink at the tank outlet, a piece of plastic (not fabric reinforced) electrical tape is put over the port and pulled down tightly to each side of the tank. Been so long since I did the last one that memory may have failed, but to get into the tank a #36 drill cuts a hole in the dimple at the rear of the tank top. A 6-32 tap prepares threads for a 1/8 inch 6-32 Allen head set screw. Before filling, a small clamp is used to slightly compress the tank walls. A syringe fills the tank to within 1/8 inch of the top. Practically, I tip the tank while filling so the fill hole is near the highest point. Before removing the clamp, the set screw is put in place and flush with the tank top. A small piece of masking tape assures an air seal. The clamp is then removed followed by the tape on the output port. Only annoying leak occurred when I failed to tape the output port. Never had a fill hole leak though I often re-use the bit of masking tape for several refills. Sorensson, that's a pretty detailed method you've got there. They not only seal the outlet hole VERY well, but also act as a great holder for the clip to keep it upright as I refill. Has anybody else had an issue with overfilling these cartridges or is it just me? I think part of my issue was that I waited for the sponge to absorb as much ink as it could, and then I filled the reservoir too much. Sorensson, when you fill 1/8 of an inch from the top, does that put your ink above the level of the sponge? Yes, Rob, ink-level is well above the sponge when I complete filling. Just checked tanks in i860 and i950 some of which certainly were refilled during the past week or two. Yellow in the i860, and photo magenta and cyan are well above the sponge level. One of my early mistakes with the i860 was to remove the label from the 3E-Bk only to realize that it was part of the air flow labyrinth permitting and controlling ink flow from the cartridge. Electrician's tape replaced the label and the cartridge has been reliable. The idea of using a clamp while refilling came from experience with HP 51645A cartridges. A Dataproducts kit -good for two refills- was my first. Instructions for the 52645A called for use of a large binder clip to press the tank walls. A set-screw was also recommended to close the fill hole before removing the clip. As I recall, there was also instruction to let the cartidge sit upright for 30 minutes to allow internal air to stabilize. Obviously, this step is unnecessary with the Canon cartridges; in fact, I soon gave it up with the HPs. Whatever may be the fact, I assume that removing the clamp from a refilled Canon cartridge causes internal air pressure to drop minimizing ink flow to the output port. Via the labyrinth, internal air pressure returns to whatever is "normal". Perhaps I should let a refilled tank sit with the clamp and output port tank removed to learn if and when ink appears at the port.